Written by katie sullivan on Tuesday, March 22nd, 2016 at 11:34am. 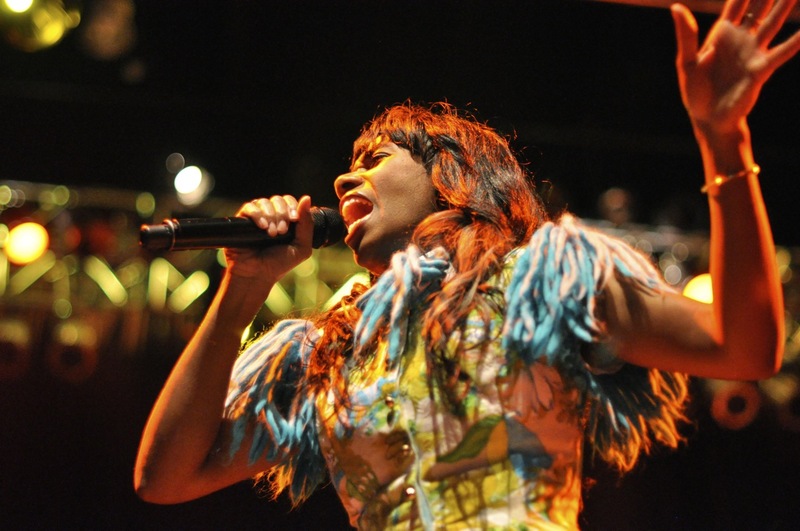 With four long years since her last album and major tour, Santigold was bound to show a few seams in her performance. But her House of Blues Houston debut show was a hot, bubbly, lovable mess. Harbingers of discord rang early. At showtime, supposed opener Leikeli47, the bemasked Bed-Stuy rapper who stole onto the scene of 2015 with her effusive sounds, was nowhere to be found. When Santigold finally emerged, messy and resplendent in a dress bearing the words “We Buy Gold,” the audience was excited but cold from the wait. Santigold knows how to put together a set, leading with memorable crowd pleasers like 2008’s “L.E.S. Artistes” and the punchy, up-tempo “Banshee.” The singer didn’t miss a note on these songs, even as she struggled with a fussy monitor. Nevertheless, her sonorous voice couldn’t mask the comedy of errors that piled on throughout the evening. Leveling issues plagued “Say Aha” as Santigold tried to engage the crowd in a call and answer, and the performance of “Walking in a Circle” abruptly stopped, apparently due to challenges with the backing track. A bright spot amid the disorder was the the show’s cheesy theater of personal branding, a satirical extension of the theme of Santigold’s most recent album, 99¢. Her backup dancers grooved stoically through a performance of vapid consumerism: lounging in inflatable chairs eating Cheetos, languidly snapping photos with selfie sticks, puttering on stage with kiddie shopping carts. Each wore a shapeless sweatshirt screen printed with Santigold’s face, suggesting that the monolith of Santigold, her ironically constructed brand, consumed and obscured their own expression. Moreover, Santigold’s warm and earnest performance made many failures forgivable. She stopped her set to sign posters and sing “Happy Birthday.” She flooded the crowd with bubbles during the rapturous smash hit “Disparate Youth.” Much to the chagrin of House of Blues, I’m sure, Santigold invited a chunk of the audience to come up on stage for a rousing dance-off to “Creator.” The Houston crowd, keeping it trill per the usual, didn’t sweat the technical issues. Instead, they melded into a tight, undulating mass of joy, rapping and grinding along to the anthem of authenticity. The show’s fits and starts swallowed up much of the technical refinement that makes Santigold’s work stand out, but the audience didn’t seem to mind. Enamored with the revision of “Brooklyn We Go Hard” to include Houston, no one noticed the strain in Santigold’s voice. Revved up by the aggressive bounce beats of “Big Mouth,” no one heard that Santigold missed her cue or saw the drummer mouth “man, that’s loud” as the speakers nearly blew out with synth sounds. The audience still expected an encore, even when she finished with the obvious closer “Can’t Get Enough of Myself” (apparently, they couldn’t get enough either). Santigold is a seasoned enough performer and will no doubt work out the kinks by the time she reaches San Diego. Only a few balcony seats remain for the March 29 show, so nab them while you can.